Construction has begun on the R24-billion Savanna City lifestyle housing development situated near Orange Farm, 35km outside of Johannesburg. The Premier of Gauteng, Nomvula Mokonyane, launched the ground-breaking ceremony which took place today and was attended by dignitaries from Government, the private sector, community and media. Poet Gcina Mhlope opened the festivities. Savanna City is being developed by Basil Read and Old Mutual’s Housing Impact Fund of South Africa (HIFSA) as one of the largest privately initiated urban lifestyle developments of its kind in South Africa. It is a sustainable, integrated, mixed use development with all the necessary amenities to offer a quality lifestyle. The 1462 ha Savanna City Development will provide 18 399 integrated, mixed income housing units, schools, clinics, churches and retail and commercial sites. Fully subsidised houses (FSH) houses will make up over 30% of the development. What makes the development so unique, is that it puts community at the heart of the development, by providing spaces for families to meet, play and nurture their children, through parks, schools, churches and retail/entertainment spaces. The aim is to place suburban home ownership in the hands of many South Africans. The development is funded by HIFSA a R9BN fund created by Old Mutual, DBSA, GEPF and Eskom, as well as Basil Read. 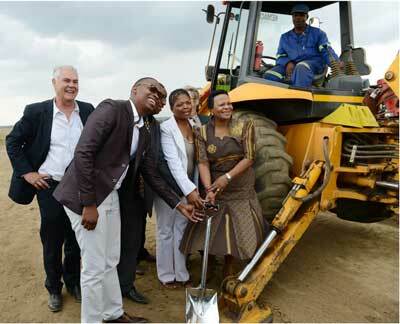 Further funding will be provided by National Government and the Gauteng Department of Human Settlements. The Development is expected to have a total economic impact of R28.4BN during construction and R12.7BN post construction. The total employment to be created during construction is estimated to be 54 900 and 12 700 post construction. Savanna City will assist in responding to the urbanisation facing the broader Gauteng city region, and will stimulate further economic development in Southern Gauteng as compared to the north where investment has traditionally gone. The Savanna City story is about creating sustainable legacies and putting down “roots” – becoming part of a community, a neighbourhood and creating a home. Basil Read and HIFSA are currently developing over 100 000 affordable housing units in projects throughout South Africa. The event was ended by a tree planting ceremony by Premier, Nomvula Mokonyane, The MEC, Ntombi Mekgwe, The Executive Mayor of Sedibeng, Simon Mofokeng and the Executive Mayor of Midvaal, Bongani Baloyi.